Metal filter problems like corrosion, pore occlusion, and surface reactivity can lead to high maintenance costs, process failures or product contamination. Lets's discuss how to prevent common filter problems and, consequently, how to save time and money. In this blog post we'll examine common problems affecting the performance of metal filtration systems and discuss how CVD coatings solve these problems. How 3 common metal filter problems can impact filter and process performance and product quality. How CVD barrier coatings can penetrate and coat metal filtration elements. How using SilcoTek® coatings affect the performance and lifetime of metal filters. How CVD coatings can reduce differential pressure. 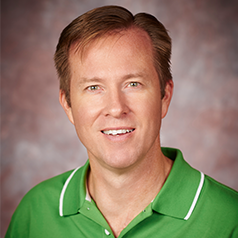 How an inert coating can prevent product and analyte contamination. Frequent filter replacement, contaminated product, analytical test failures, and sub par flow performance are all symptoms of 3 basic filter problems. Corrosive fluids may attack the filter, causing damage and eventual failure of the filter element. Corrosion will not only compromise the function of the filter, but will also contaminate the stream passing through the filter. 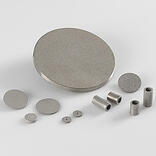 For some applications, metal ion contamination from a metallic filter is a major concern, whether or not there is measurable corrosion. If the media passing through the filter can react with the filter substrate, there can be chemical adsorption and/or catalytic activity that would be detrimental to the process stream. Chemical adsorption by the filter element can result in product quality problems and analytical test failures. Finally, and most obviously, all filtration media can eventually suffer from pore occlusion and flow restriction as media builds up within the filter. This would progressively reduce the filtration efficiency and eventually require filter replacement. Frequent filter element replacement (this can be expensive and can lead to significant downtime). Installing a filter element made of an inert, non-reactive material to prevent product adsorption or analyte adsorption (this can also be an expensive solution and may not offer the durability needed in a filter element). Learn how the experts prevent fouling. Read anti fouling whitepapers. SilcoTek employs a process called chemical vapor deposition (CVD) to apply anti fouling, inert or corrosion resistant coatings to stainless steel, ceramic, or alloy filter surfaces. The benefit of a CVD coating is that the process will allow the coating vapor to penetrate the filter media and coat the internal surfaces of the filter. Because the deposition is so thin, coated filter media aren't clogged or restricted by the coating. The coated fritted filter cross section below shows how the filter surface is penetrated by the silicon CVD coating. The outer coating layer has the thickest coating which is indicated by a green surface color. The interior surfaces are also coated but with a thinner layer (pink and gold colors). The thinner coating continues to be an effective barrier while allowing the filter to perform without a significant increase in back pressure. SilcoTek applies its coatings via chemical vapor deposition (CVD), which allows for all of the filter surface to be covered throughout the entire turbulent flow path. We have performed cross-sectional SEM/EDS analysis of SilcoTek coated metal frits to prove this. Do CVD Coatings Clog Fritted Filters? SilcoTek offers a few CVD coatings that address filter performance problems. 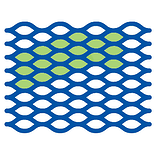 Dursan® and Silcolloy® are both proven to improve filter corrosion resistance. Silcolloy is a multilayer amorphous silicon deposition that is highly effective at preventing acid corrosion, as well as providing a pure silicon barrier coating, thereby reducing interaction between the metallic filter substrate and the media flowing through the filter. Dursan is a high durability coating that offers both acid and base corrosion resistance. Both coatings can withstand extreme temperatures and "industrial scale" abuse without failure. The graph below tells the story. 316 stainless steel, Silcolloy 1000 coated stainless steel, and Dursan coated stainless steel coupons were immersed into 6M hydrochloric acid at 50C for 24 hours. The corrosion rate in mils per year (mpy) was measured and compared. The Dursan and Silcolloy coated coupons dramatically improved corrosion performance. 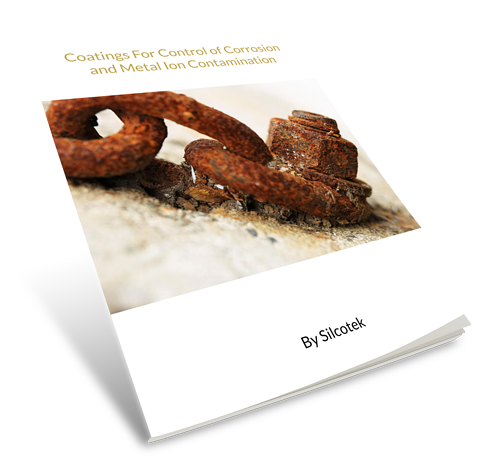 SilcoTek® offers 2 coatings that can prevent surface interaction and product contamination. Dursan is an excellent anti-corrosion coating, and has a wide pH range of applicability. It is also extremely chemically inert to adsorptive interactions that can cause test failures in chromatographic and analytical applications. The SilcoNert 2000 coating is also an excellent choice for chemical inertness, particularly for low-level ammonia, mercury, and sulfur analysis. When a surface is inert, it does not interact, adsorb, or otherwise alter the fluid coming in contact with the filter. This can be especially important when testing reactive or contamination-sensitive chemicals. A non-reactive surface also means overall system analytical test response is faster and more complete. This means all the analyte quickly passes through the filter without change or contamination. 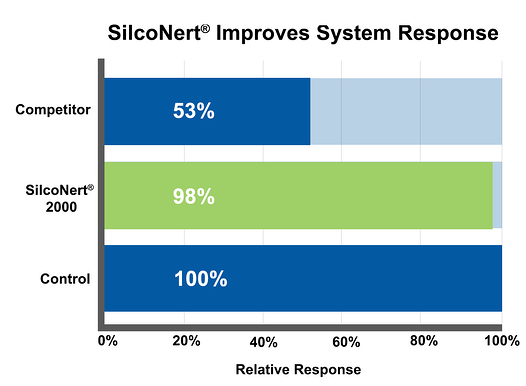 The graph below compares the system response of a typical "inert" surface with SilcoNert® 2000. The SilcoNert surface responds faster and allows nearly all the sample to pass through the filter when compared to the ideal control. What is the importance in reducing filtration differential pressure? Differential pressure is the difference between the input pressure before a filter vs. the pressure exiting the filter. Depending on the pore size and flow characteristics of the filter, there is a certain efficiency of flow through the media at a given pressure, i.e. the amount of pressure required to maintain a desired flow through it. As a filter removes filtrate from a flow media, the pores will fill up and become occluded, which will progressively decrease the flow through the bulk filter. In order to maintain a target flow rate, it becomes necessary to increase the pressure at the head of the filter, thereby increasing the differential pressure. Once the differential pressure becomes too high, the filter must be removed from service and replaced. As long as the differential pressure is reduced, the filter can remain in service. It's the job of filters to catch unwanted materials and allow the desired filtrate to pass through without changing the nature of the fluid. At times this can be a challenging task, especially as the filter load increases. Changing the surface energy of the filter surface can go a long way to improving filter performance. A high energy surface will wet easily and allow particulates to be captured in the filter but can also allow the filtrate to adhere to the filter surface. This will contribute to an increase in back pressure and flow problems. 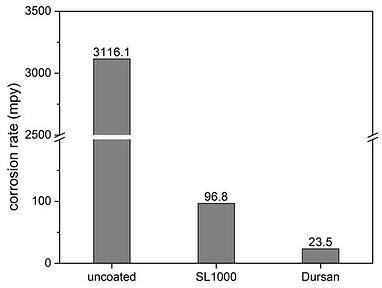 Dursan coated filters have shown excellent anti-fouling capabilities, where filtrate will not readily adhere to the low-energy Dursan surface. As a result, filtration efficiencies and lifetimes for Dursan-coated media can increase dramatically when coupled with back-flush and back-pulse protocols. 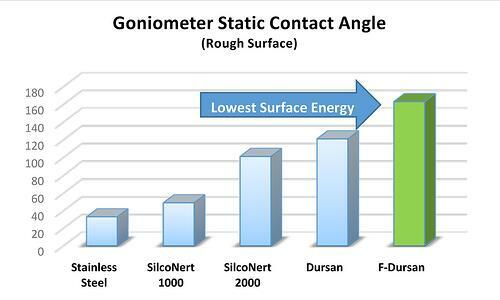 Comparative goniometer contact angle measurements below show that the Dursan and Notak (shown as F-Dursan) have a very high water droplet contact angle and the lowest surface energy when compared to a stainless steel surface. Want to learn more about how SilcoTek® coatings can improve filter performance and prevent fouling? Contact our technical service team or check out our anti-fouling webinar.